I had so many hiccups with work today. It was just one. of. those. days. I won’t bore you with the details though…!! If there is one thing having my own bakery has taught me, it is that my own personal meals need to be QUICK, easy, yet still nutritious. After a slight set back during clean up (I spilled a huge bag of GF rice crisp all over the kitchen! DOH!!!!!!!! 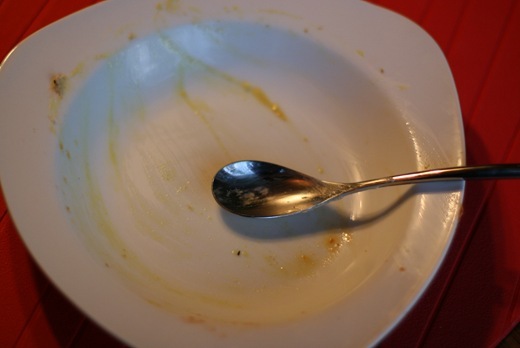 ), I dove into dinner mode. Chia seeds were my best food find in 2009. 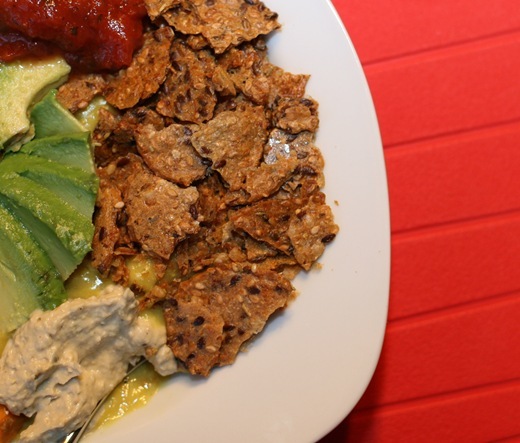 My best food find in 2010 is nutritional yeast (so far anyways!). 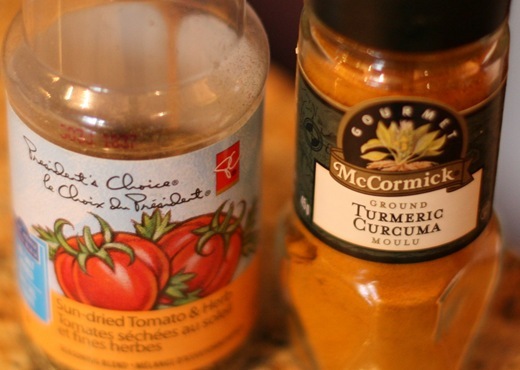 Although I started to use nutritional yeast in 2009, I didn’t really appreciate it until recently! Nutritional yeast is a great way to reduce your cheese consumption, yet still create fabulously cheesy and decadent dishes! It is basically a vegan’s dream, but anyone with any diet can incorporate this into their meal plans. Directions: Mix all ingredients together in a pot and bring to a boil. 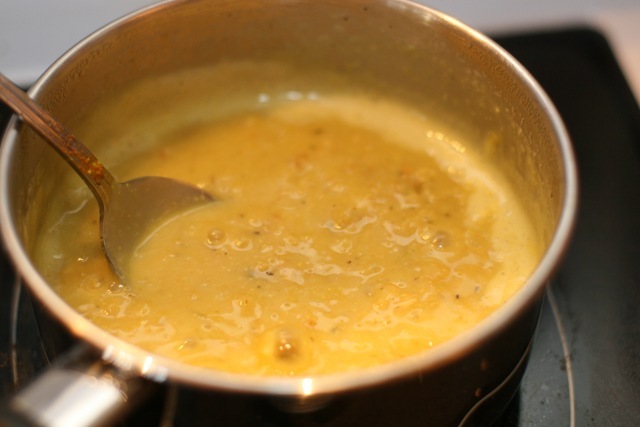 Reduce to low and cook for 10 minutes, stirring frequently. Creamy goodness. You will not be disappointed when you try this. I couldn’t find the new Mary’s twists in Whole Foods the other week! Hope they arrive soon. Anyone tried them? Steam coming off the spoon! Thanks to those of you who suggested adding nutritional yeast to my oats! It was the most beautiful and decadent tasting dish I have had in a long time. Yet healthy, vegan, and packed with superfoods! You could even add a tablespoon of chia seeds to the oats for an extra kick if you are feeling down right crazy. Eric and I have this inside joke between us involving the word BOOM. If you have seen the movie Couples Retreat you will know what I’m talking about. In one scene the yoga instructor teaches a class to the couples. He twists and bends the women’s bodies all over the place and as he moves their body, he says BOOOOOOOOOOM in this really creepy voice. It is just hilarious and we were dying laughing as we watched it. Anyways, now Eric and I always say BOOOOOOM at random things and we laugh our heads off. Eric saw that I wrote boom in Sunday’s post and he said, ‘No one is going to know why you say that you weirdo!’ lol. So…FYI! Dessert- dried organic apricots. Booooooom. Nature’s iron supplement, I call these! What is your best food discovery (or favourite meal) so far in 2010? 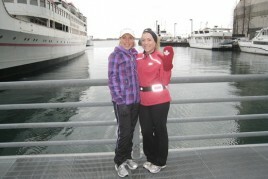 A Glo Bar giveaway over at Fit This Girl! Do you know a baby girl in your life? Check out Baby Enchanted’s newest site just for girls called Trixi Lou Couture! Through the month of March, US residents receive $10 off any purchase of $50 or more. Just enter code OSG10 at checkout to receive this special offer. You can also check out their Facebook page here. Favorite discovery so far? Well…let’s talk! Green monsters of course. :) Plus my own secret ingredients. Oats in a PB jar! I STILL haven’t tried Oats in a jar!! NO way!!! Girl, you MUST try OIAJ.. they will amaze you. What are oats in a jar? Oats in a jar is when you take an almost empty jar of nut butter and add a serving of cooked oats (like whippped banana oats) to the jar. The hot oats melt the nut butter and you get a bite of nut butter with each bite of oats.. to die for! Yea I made it tonight b/c Eric was working late and I know he hates oats! Oh my gooooosh foodgasm. I need to make these, ASAP! I just tried nutritional yeast in 2010 – however, when I bought it I only got a tiny bit because I thought it might be weird, and now I’m having trouble finding it anywhere! I really liked it on top of spelt pasta with spices, olive oil, and pine nuts – yum! Did you try a bulk food store? Thats where I found mine. Is there any concern that one would get an overdose of B-vitamins or other nutrients found in nutritional yeast or would you need to consume an awful large amount to do that? Almost no danger of B-vitamins overdose, since they are water-soluble. Any extra your body gets would be eliminated in the urine. The overdose-prone vitamins are the fat-soluble ones: A, D, E and K, because our bodies have no way of getting rid of them. Even those, however, usually need pretty high doses of supplements to give you enough to see overdose symptoms. LMFAO!!! I love couples retreat!!! AND I am so going to try those oats! YUMMY YUMMY!! 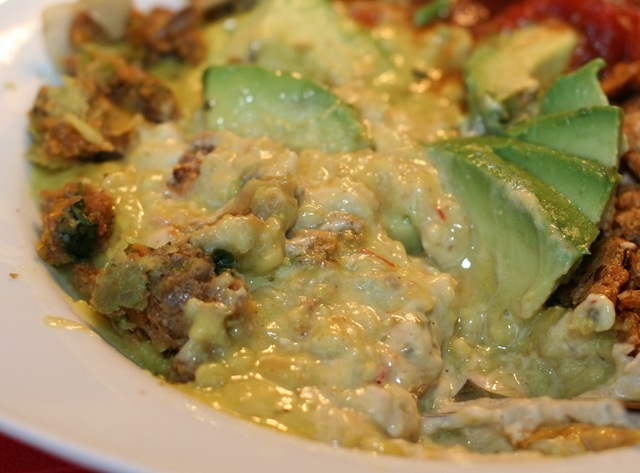 I don’t usually like savory oats, but I’m really liking the idea of something ‘cheezy’ and avocado. interesting! I’m a bit intimidated by nutritional yeast (same with chia seeds). My favorite food find this year was goat cheese. I don’t know why it took me until 2010 to try it. I didn’t really know it existed, to be honest. Oops! I agree Ashley. Anything with the word yeast reminds me of an infection…. yuck. Definitely green monsters. I had green smoothies before, but in January I started trading my regular protein shakes for green monsters, and I haven’t looked back. 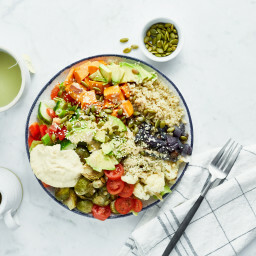 More of a storage discovery – I buy nutritional yeast, chia, hemp seeds, sea salt in bulk and keep them in shakers for easy addition to salads, soups, etc. anytime! great savory oat recipe! 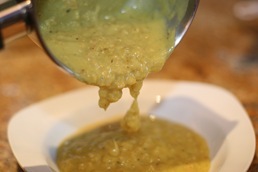 i always make savory oats, never thought of adding nutritional yeast, that is such a great idea! I’m with you with nutritional yeast! I LOVE it. It has changed my life! OMG that’s beyond cool that you were linked on FitSugar!!!! That was the FIRST blog I ever read (well, PopSugar was). haha it seems like forever ago that I discovered that site. SO SO cool you were linked! I always look at those…cant believe I missed it today. The Sugar websites were some of the first ones I ever read too…I love them! Dried apricots are my favorite dried fruit!! YUM! are rolled oates the same as oates? i have some rolled oates i would like to cook up i’d like to try this! I think as long as they don’t say instant they are the same…? I’m reminded that I haven’t had any in a while and they are so delicious. Angela, this is so funny, I made oats almost EXACTLY like that last week! Except I made them even weirder by having them in an almost empty PB jar and stirring in some hummus. I know, I know. hmm best food discovery this year? I started loving Chia seeds last year, but i guess Chia pudding and almond milk is this years new thing. I just bought some “nooch” today!! That’s so ironic that I’m reading this now and I’m so excited to use it on my popcorn tonight! your savory oats look DIVINE! I’m too sheepish to try them in fear of not liking ’em! Nutritional yeast is quite possibly my favorite ingredient to cook with, and has been a STAPLE in my diet since going vegan last summer! Wow, those savory oats look like cheese grits (a classic southern breakfast)! They’re good, but they don’t hold a candle to the crackers. My favorite meal that I have discovered this year is the Runza’s I made. They are so good and remind me of being back home! Thank you, Lady Glow! I’ve wanted to like oatmeal *forever* since it’s so good for you, but I’ve never really been able to get into it… until your genius idea of adding nutritional yeast! I just made a little test portion using your recipe but using a tablespoon of oats and 1/4 cup of brown rice (hey, starting slow). I stirred in the salsa, so it tasted like queso dip. It was so, so yummy! My best of 2009: Green Monsters! My best of 2010: nutritional yeast! I have never had nutritional yeast – I will have to check my local health food store for it. I still haven’t had savoury oats … I need to just DO IT!! Nooch is awesome!! I was afraid to try it, the yeast part kinda freaked me out, but so glad I did. It really is cheesey!!!!! I have also been afraid of savoury oats.. but these look awesome. I need to take the plunge!! And best food find this year so far – Chia seeds, xanthan gum, and nooch. My best discovery has probably been black beans. They are pretty hard to find in Australia – but I now found a small shop nearby that sells them yay! I just bought some nutritional yeast and didn’t know how to use it, I’ll have to try this! I saw your link (and photo!) in FitSugar today and was all excited! Hehe. This looks DELICIOUS! Everybody seems to be posting about nutritional yeast. Why-am-I-so-behind?? Looking forward to adding to the list. Nooch next, perhaps? I think those pictures may have just sold me on the savory oats idea. I trusted you enough to try the green monster, don’t know why little old OATS scare me! Cheesy oats, I haven’t tried that, for sure! I tend to use polenta as my savory, grainy, creamy dish and I love to add nutritional yeast but I might have to try savory oats…boom! Ok, i’m not going to lie, nutritional yeast kind of freaks me out. I have no idea why. I feel like I would buy it, it would sit on the counter and I’d just stare at it wondering what in heavens name I was supposed to do with it! You’re a genius. That looks like it’s packed with cheese. And anything cheesy tasting is awesome in my book. I’m a little behind. My favorite of 2010 so far is almond milk. That looks so amazing. I can not wait till I’m back home in my kitchen to make that oatmeal. 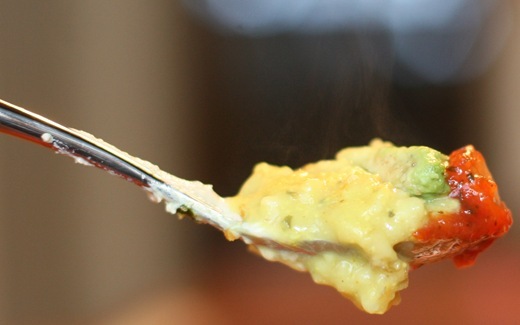 I love oatmeal but I’ve yet to try savory oatmeal and cheezy oatmeal would be fantastic!! That cheezey creation looks tasty, I end of learning so much about food that I had never known, or would have thought existed if it wasn’t for you…. Am I really that sheltered in the food world? I love savory oats! Ive never added nutritional yeast to them though. Sounds just crazy enough to work!! That’s a hard one! Even though it was really at the very end of December 2009, I have to go with Kabocha Sqush! I was just thinking about oats today, because it seems like everyone is inhaling oats in the am. I have to load mine with tons of sugar to get them down, which isn’t really healthy so I dont have them. However, I’m definitely going to try the nooch version. I like dry oats, just not oatmeal but this different flavor may help :) I love how creative you are in the kitchen. Almond milk is probably the best and most useful food discovery so far this year. I’ve been trying so many delicious foods I see on other blogs though! Nutritional yeast is on the list, along with liquid aminos. On another note, that yoga part was the best part of that movie for sure! I just tried savory oats for the very first time today. I can’t believe I have been afraid of them all this time; they are so good! I have nutritional yeast on my list of things to try SOON. So glad you tried the nutritional yeast and liked it! And, to one of the above comments, I eat nooch with hummus and veggies ALL THE TIME. In fact, that was my lunch today! My favorite discovery of the year so far has been sunflower seed butter! I am in love. Nutritinal Yeast is my godsend food, being lactose intolerant! Just bought my first box of nutritional yeast last week, am intrigued about having them with oats…! 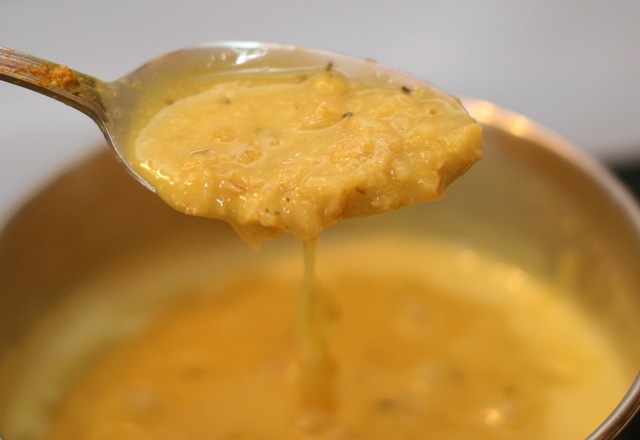 My boyf is a cheese-hound so have been trying to find a good cheezy recipe for him – might adapt yours, maybe with quinoa? Mary’s Crackers look so delicious, wish we had them here! My favourite find through the blogosphere is coconut oil! Thanks for the info on nutritional yeast. I had seen it mentioned on another blog but had no idea what it was… Would not have guessed it was cheesy. I am soooo tempted to try it! The savory oats thing is a little too daring for me at the moment.. I don’t know about that texture thing.. haha. And BOOM is funny.. I actually say BAM a lot. like A LOT. I haven’t even tried chias yet so I’m wayyy behind! I just won a two lb. bag though and I’m so excited to try them out! Then I need nutritional yeast in my life :). Best food find of 2009 was definitely oats in a jar! Where do you buy your nutritional yeast from? Oh yes! I totally agree with how wonderful and tasty nutritional yeast flakes are! I love them on popcorn! Will have to try them on some savory oats soon! Looks yummy! Dates! I am loving dates lately! They are nature’s candy! Hmm..greatest discovery is definitely nutritional yeast. So far I just make desserts with it and sprinkle it on popcorn, but I’m learning more! Yumm!!!! This is something I must try. I’ve been wanting to cut back on cheese, but I just love it too much! 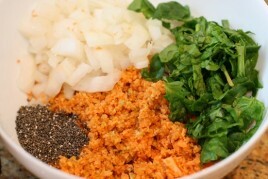 My favs for 2010 so far are garlic greens (any kind of greens will do) and overnight oats! I can’t believe I’ve lived so long without these! Another new food brought to my life by the blog world I will have to look into!! This post made me laugh because I dated a guy whose nickname was Nooch. I will never look at him the same. Haha. My favorite discovery so far has been cous cous. I am mixing it in with everything and love how simple it is to make!! Mmm those cheezy oats look amazing and seriously cheesy! I’m hungry for lunch now and it’s only 11am! Angela, I have an uncomfortable question that I just need to ask. Do you know anything about the effects of nutritional yeast on yeast infections? Before I started eating yogurt regularly and stopped using artificial sweeteners, I tended to be prone to yeast infections. Does nutritional yeast increase the levels of yeast in the body, or is it a totally different type? I have heard that it is not related, although I am not 100% certain. Anyone else know? No, definitely not related. Candida yeast is the ‘bad’ guy that lives in your body that you don’t want to be overpopulated. -Dried figs and dried dates. 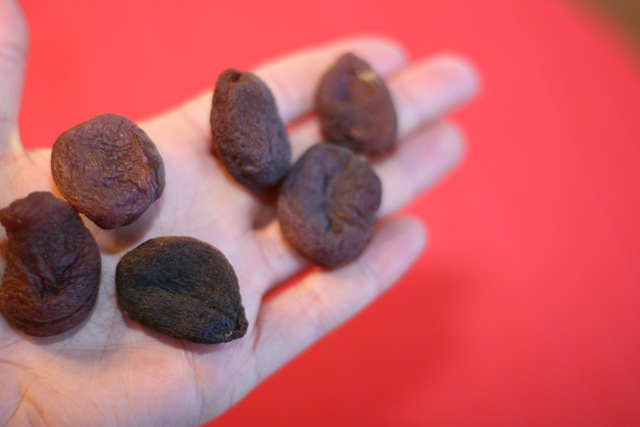 I sweat–the dried dates (the good ones) taste like pastries! WOW! That looks sooooo good! I think I need some nutrional yeast in my life. Yum, this looks great! I love Nooch too but haven’t had it since I was a kid (my mom used to get it all the time)! I feel like this would be great with polenta too. I have wanted to try nooch before but never really had the urge to buy it. Now I do! Ahhh!!! Oh my world, this bowl of oats looks amazingly good Angela!!! 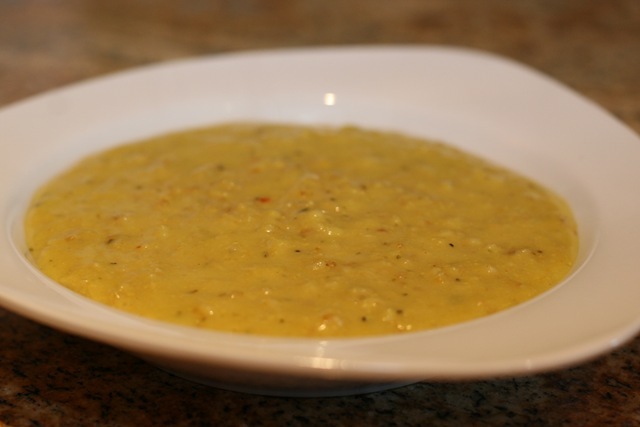 I also enjoy savory oats, sooo good, it is like oat risotto!! 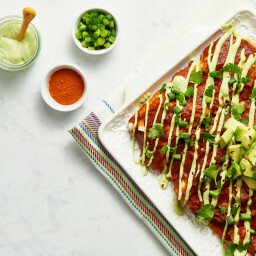 I loved the very first one you posted about and thought the mexican themed one was so creative, but this one beats both of them, the good looks and the toppings you chose, wow, I love the pictures! Will be having oats for dinner tonight for sure!! I may just not be looking hard enough, but what kind/brand of “nooch” do you buy? I’ve hunted online and Bob’s Red Mill has flake yeast, but I wasn’t sure if that was the same thing. None of those in the states, unfortunately :( I’ll have to give Bob’s a try and see how it works! My best in 2009… GREEN MONSTERS! 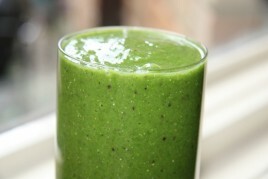 I do NOT like spinach, so it never occurred to me to add spinach to smoothies! Now I have my entire family hooked! I tried nutritional yeast today and I’m in love! I made Quinoa rather than oats and it was DELISH! 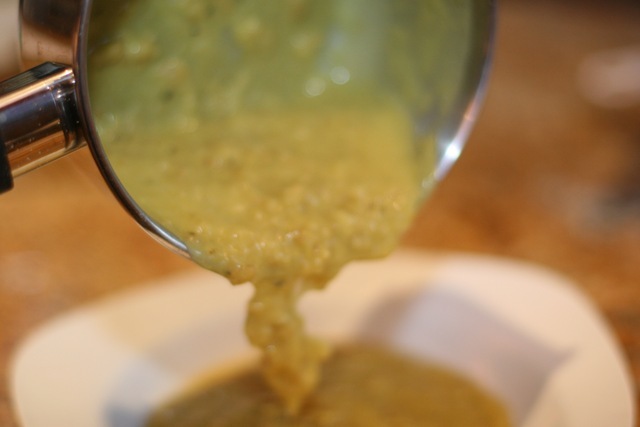 My boyfriend always adds nutritional yeast (aka “nooch”) to his oats…along with sweet stuff. I always tell him how weird it is, lol. Maybe I’ll actually try it for myself sometime. 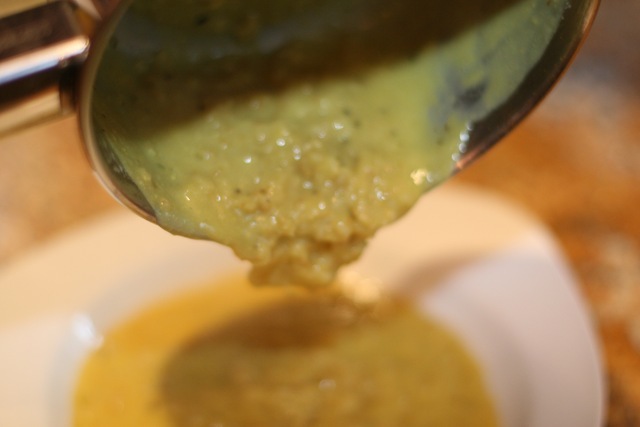 I love nutritional yeast, it tastes awesome in tofu scrambles, soups, and on pasta. My favorite discovery this year (so far) has been smoothies. I know, I know, everyone already knows how awesome smoothies are, but it took me a while to figure it out. Oh, man! To be honest, savory oats have not sounded appealing to me until now. 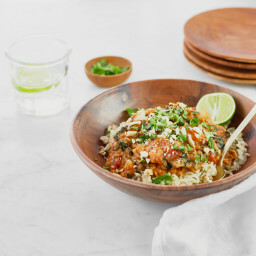 That cheesy bowl just looks so delicious! Nutritional yeast is one of my best food friends. :) What an awesome dinner! That’s so funny! I think my favourite find of 2010 has been nutritional yeast, too! I’m going to have to try the oats … I love cheesy things! I’ve even rekindled a friendship with a product this year – Vega’s Whole Food Vibrance bars. Last year I hated them and this year I adore them! Who knew that flip would happen? I give nutritional yeast the big thumbs down! Ew. I wrote a post a few weeks ago about foods that are always being hyped on fitness blogs that I hate and this was one of them! Nooch is not cheese, there’s no fooling me. I think nutritional yeast is great. Its an awesome and very bio-available way of getting B vitamins and more. If you don’t like the taste Jenna Z, then I recommend taking it with spinach, kale and broccoli green juice recipes – hehe. My husband is away so I just made this — much to my children’s horror — it is sooooo delicious!!! I only recently made the decision to eat healthy. I know this sounds ridiculous, but my favorite food discovery so far is tomatoes! But 2010 has just begun- I can’t wait to try a GM or something spelty, lol. That recipe looks so good! Unfortunately I had a bad experience with mooch and I have not tried it since. Maybe I need to push myself to give it a whirl. Best food to date? My rAw granola bars! Yum! Ah, totally need to make this. 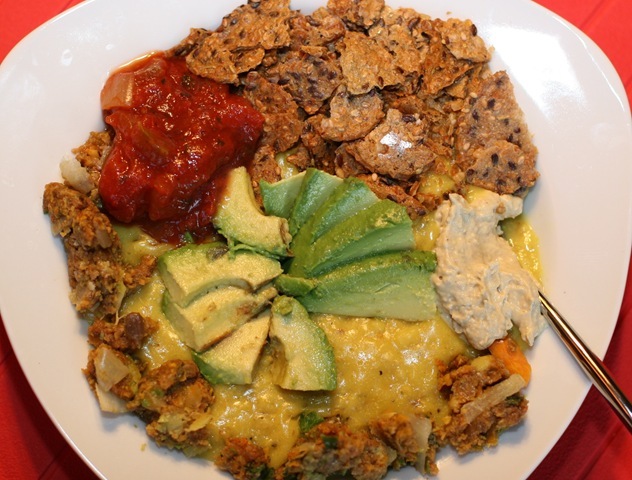 I’ve been trying to think of something for dinner and I think the cheezy oats will be it! Avocado- I was always meh about avo. Didn’t think they were anything special. Now I’m addicted, can’t get enough avo. I eat a 1/2 of one several times a week. Sadly, I’ve also discovered one thing I don’t like. I’m going to get tomatoes thrown at me for this. 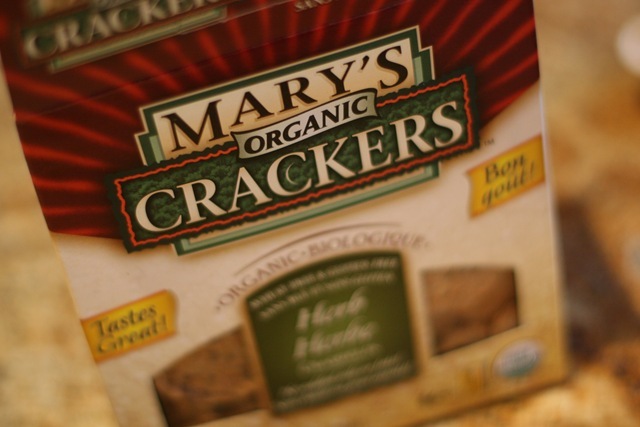 Mary’s Crackers. Do. Not. Like. The texture and taste is just so odd and not pleasant to me. What kind of nutritional yeast brand do you use? I’ve been trying to find it everywhere and I can’t seem to get my hands on it! Cheezy oats look really amazing. I love nootch, I just need to find it! I know I’m a day late here, but I made your recipe with soft brown rice instead of oats and had it on a bed of kale with some sesame seeds. I also subbed curry for the turmeric and coconut milk for the almond milk. It was really delish! I think this is a bowl of savoury oats I could get behind. I’ve always shied away from them, because I do love my sweet oats for breakfast (or dinner), and I couldn’t think of the perfect combination of savoury flavours that would work for me. I bet adding some corn would work well with the avocado and salsa in the cheesy oats. And I think I actually have all the ingredients for this in my house! Woot! I’ve been wanting to try these oats for so long but I’m either eating at work or eating with my boyfriend. I wanted to eat them so badly tonight that I sent boyfriend home after we weight lifted together. I’m pretty sure he wouldn’t these…but I am enjoying them right now. I have some ideas for the future. Thanks for sharing your obsession! I added ground cumin to the oats instead of the tomato/basil seasoning. 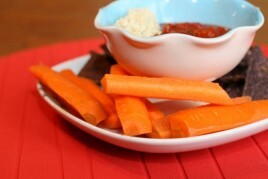 I served them just like Ange did….with Mary’s crackers, avocado, and salsa. Also squeezed a bit of lemon onto the avocado pieces, and drizzled it all with extra virgin olive oil instead of putting oil into the oats. Thanks for another great recipe Ange! You rock! I JUST made this an hour ago, delicious ! I used it as a topper for 1/2 cup lentils, steamed broccoli, mushroom, zucchini, onion and red bell pepper. Very, very good, filing and nutrient-packed! Thanks for the excellent recipe ! Haha!!! That’s so funny, because my husband and I use the BOOM joke all the time too!! That’s why I was laughing about the empty plate “Boom-effect” before you explained it. Yum… I was so excited to make these oats that I actually had them for breakfast this morning! Very interesting and delicious!! Thanks! I make these cheesy oats all the time!! I am addicted! Last night I added a few tablespoons of pumpkin for extra color and added veggies! It was fantastic!! Hands downs you have some of the best vegan recipes!!! I was looking for a new way to cook oatmeal and no doubt in my mind OhSheGlows had it! This savory oatmeal dish will be a staple in my vegan diet!!! So good! Thanks for all the wonderful recipes you blog! Loved by both my four year old and I! I added butternut pumpkin puree, hummus, Dijon mustard, peas and corn. Perfect comfort food. Thanks! I’m trying this tonight with leeks and broccoli. I also wanted to tell you about my favorite savory oats: Cook oats with a little curry powder, add caramelized onions, thawed peas and 1 can diced tomatoes (cooked down w/ some garam masala until almost dry). I have been dreaming of savory oats for some time now and OH MY, these were *divine*. Had this for breakfast this morning–savory oats make the BEST breakfast!–added onion and garlic powder, smoked paprika (my “find” for 2014) and served with baby arugula and carrots sliced into thin ribbons with a veggie peeler. So satisfying! Made this, and it’s just what it says: creamy and cheezy! Yum. Another killer recipe! This is my first time trying savory Oats, and I’ve got to say that I think I like them even more than the traditional sweet ones! I was even able to find the same ‘little blacl dress’ seasoning, and it’s AWESOME. I topped it off with some salsa, green onions, hemp hearts, and a drizzle of Harissa infused olive oil. What is the”little black dress of seasoning”? Felecia, I had the same question: I think it’s the President’s Choice Sun-dried Tomato & Herb (in the picture with the turmeric)… That’s all I could figure out.